Hell to the yeah! 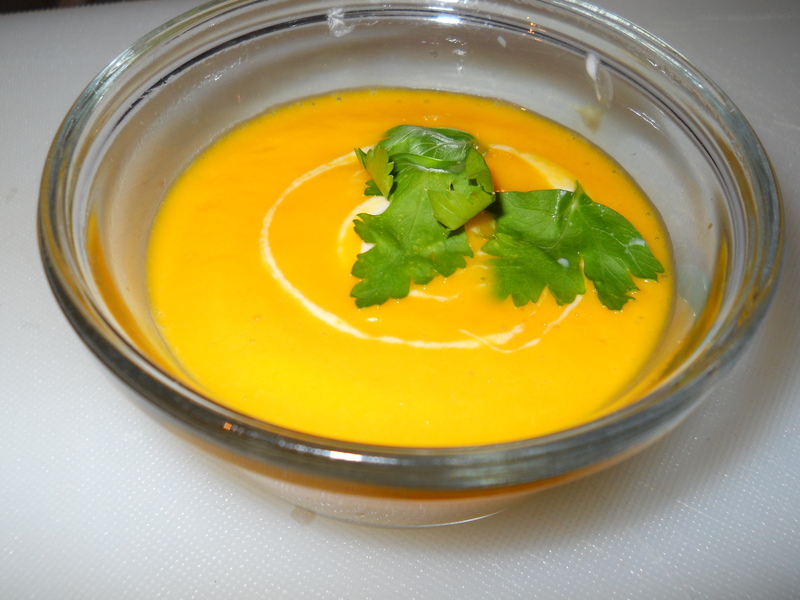 This vegan carrot ginger soup is rockin’ the socks off my taste buds. See how I made it. It’s so easy to be be veg, especially since I just started my bi-weekly organic fruit/veg box. For this week’s Weekly Gift To The Universe I am going to share some of this yummy soup with my cool neighbors. (see what I did last week). This soup is truly a gift, believe me. One difference between the recipe I used is that I added 1 jalapeno for a bit more kick. Lovin’ my new found kitchen skills! WOOO HOOO, It’s Friday!!!! 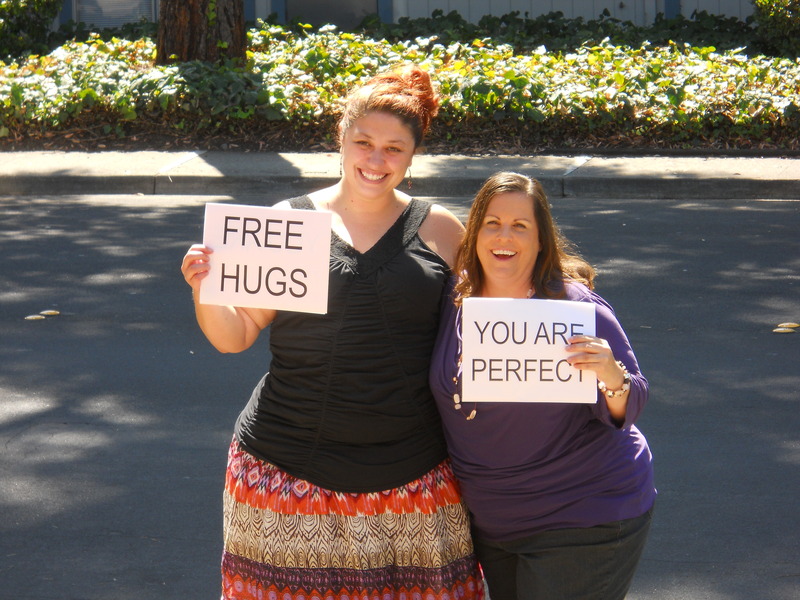 And what better way to kick-off the weekend with some positivity and FREE HUGs? This is the first of my new weekly “Gift To The Universe” – a way for me to consciously be the change and give back with gratitude to the Universe for all my blessings. The world seems really effing messed up right now and I’ve been thinking a lot about how I can help. Puh-leeze don’t get me started about how the animals are treated on this planet or we’ll be here all week. So when I ask myself what’s really going to make a difference to transform peoples’ heart, I think about how I got through the darkest times in my life when my heart was full of anger and rage. It was the kindness Anthony offered me when I needed to talk about my friend dying of AIDS. It was the compassion my family gave me after being raped. It was the unconditional acceptance my Grandpa shared with me when I told him I was veggie, “Well no one’s ever died from eating too many vegetables,” and the understanding that Ellie of The Gentle Barn shared with me recently during our conversation about going vegan. So as an Animal Ambassador whose vision is a world where all beings are safe, loved and celebrated, I recognize that it is my responsibility to bring more love, compassion and healing to the planet. So today I offered FREE HUGs as part of my activism for the animals. Because when we feel loved, our wounds can heal and our hearts can open. And when our hearts are open we can relate to the joy that a cow feels when he’s free for the first time, or to the excitement that a pig feels when experiencing his first mud bath, just as much as we experience love for our dogs and cats. As our hearts heal and we experience the profoundness of animals, we will not longer continue to torture, abuse and harm them – just for eggs, milk, hamburgers or bacon. We will see them and know them for the miraculous, smart, sentient beings that they are. So if you ever need a hug, let me know. I’m giving them away for free. Because I have a dream that all beings live in a world where they are safe, loved and celebrated! Meet Buttercup who is a resident of The Gentle Barn. She stole my heart during my visit there on 9/4 as part of my Boss Hogg Tour. Here we are enjoying the posh patio accommodations! 😉 See all the pictures here. Though Buttercup had a hard life in the dairy industry and lost her baby, she was rescued and is now the resident mama cow for the new calves. The Gentle Barn is a totally-friggin’-awesome-place that everyone needs to visit – especially kids. When I win the lottery, a big chunk of change will go to them, and then I’ll be able to sponsor any of the animals I want – including Buttercup. Cruelty is out – compassion rocks, especially with faces like Buttercup… or Patches the horse, or Jewel the peacock, or Yoda the emu! You can enjoy a variety of food from their vegan sponsors, give the horses carrots or take a picture on the cool red tractor. I did – but had to delete the pictures due to a wardrobe malfunction. No, it was not intentional. I didn’t realize I would be straddling a tractor seat that day and my dress was a wee-bit too short. Oops. So no picture of me, but I did take one of some kid. Any-hoo, enough about me. Back to The Gentle Barn. I’m sitting here trying to write about my experience, but feeling sadly unable to capture everything I felt in my heart. 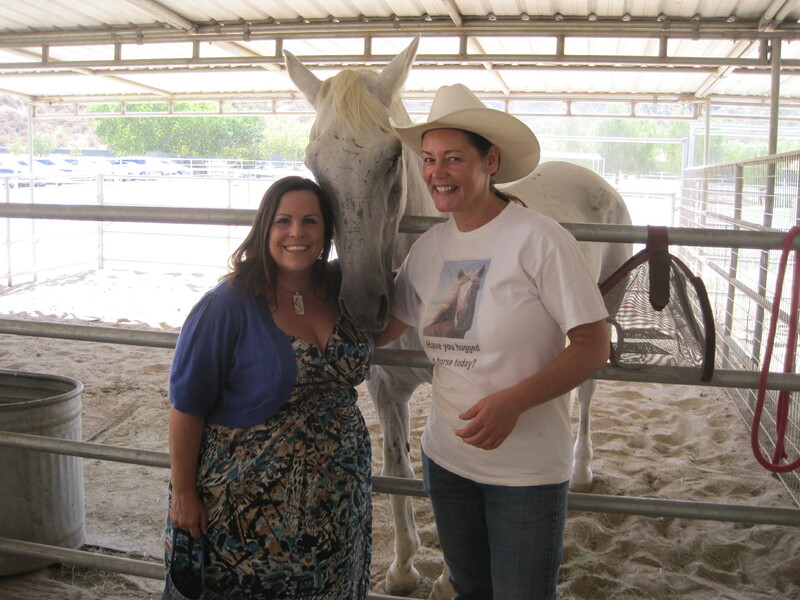 One of the most loving and profound moments I had was with Ellie Weiner, Gentle Barn’s Founder. For those of you who know Yvonne, Ellie reminded me of her. As soon as I met her I felt a generous wave of kindness, connection and love. I had nominated Ellie for Peace Alliance’s Faces of Peace, and introduced myself as that person. She shared how grateful she is to be nominated, “…even if I am not picked.” Huh – fat chance. In my opinion, peace begins with the plate! As I was leaving I stopped by to say good-bye and give her a hug. Ellie just kept looking me straight in the eyes – the way Yvonne does. Have you ever been with someone who looks into your eyes and goes straight to your soul? Just like Yvonne, Ellie looked at me with eyes of love and my heart just melted and I started crying. I began sharing my story – why I became vegetarian – because of my childhood pig, Boss Hogg who was killed for bacon and pork chops (gross!). That I was afraid to tell her that I am not 100% vegan yet, because I have horrible cravings for cheese and butter sometimes and that I have been really struggling with that. Rather than screaming in horror (as I had been afraid would happen anytime I told a vegan that…”Well I’m not quite vegan yet,”) Ellie just loved me in a way that left me feeling seen, heard and celebrated! 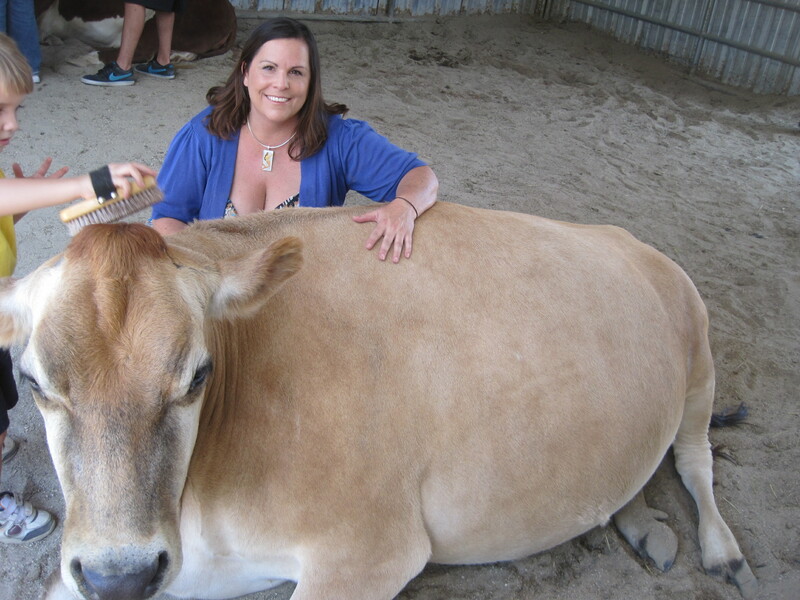 She shared her understanding about this – the body has cravings when we lack the nutrition we need; her research about plant-based foods and that I could get the info from The Gentle Barn (got it! ); and the dilemna of not preaching a certain way of life. I totally got it! She blew me away with her acceptance and empathy and I left there with a new personal hero. I’m left with an even greater belief in the power of love and compassion. It would be really easy to fall into anger and hatred towards those that harm the animals – and the industry of factory farms – but Ellie chooses to focus on the beauty of each sentient being’s soul and to foster an environment of tenderness and compassion. And I experienced that in her presence during our time together. So Buttercup has my heart and Ellie, you are now one of my heroes!